If you’re interested in delving into this business of publishing, then you’ve likely heard a lot of talk about branding. Simply put, branding clearly identifies you with a product. For the author, it might be their brand of fiction or their platform. Your brand is strong if someone hears either your book or your name and can identify the other. For instance, if I said “Stephen King”, certain things would pop into your mind even if you’ve never picked up one of his novels. If I said, “The Shining”, you could likely name the author. Stephen King has a strong brand. Your brand needs to be supported by your internet presence such as your blog or web site. Think about the images you want to portray. Are you a contemporary women’s author? Then, your site should have a different “feel” compared to someone who writes suspense. I worked with Tekeme Studios for my blog design. First hurdle to overcome was the content of the blog. How can I be different from the other thousands of blogs that are out there? What I noticed myself doing was answering a lot of medical questions for fellow writers. I couldn’t find anyone else with this type of blog. That was good because perhaps I could provide a service for other authors that was thus far unfulfilled. Second was to think of the feelings I wanted to invoke when people first visited my site. For me, these were intrigue, medical, with a slight suspense feel. Here comes the third part. You have to be willing to speak up if you don’t like the design. After all, this is your brand and your investment. You should have strong feelings about it. For me, the design read historical. The man was dressed in period garb and the cabin looked like one you’d find on the frontier. This image didn’t support my brand as a suspense novelist. Plus, I‘m a woman and why did it need to be a man answering those calls for help? Also, too bright and orange (not a huge fan of that color). Not an ominous feel at all. You’ll know you’re with the right design team when they understand your concerns about the design and are not offended about making changes. After discussing my concerns, it became as follows. You can check out the full implemented design at http://jordynredwood.blogspot.com/. My challenge to you: Are you thinking about what your brand is? How are you evoking that brand image with your internet presence? Ask people to visit your site and give you thoughts about what they feel. If you’re a suspense writer, people should feel ominous… maybe a little worried, like they will when they read your novels. These are some examples of authors who I think have portrayed this well. Visit their sites for a little homework. Do they have a strong brand? Do they evoke certain feelings when you see their imagery? I think what they’re doing supports their brand of novels. What are some things you’re doing to support your brand? 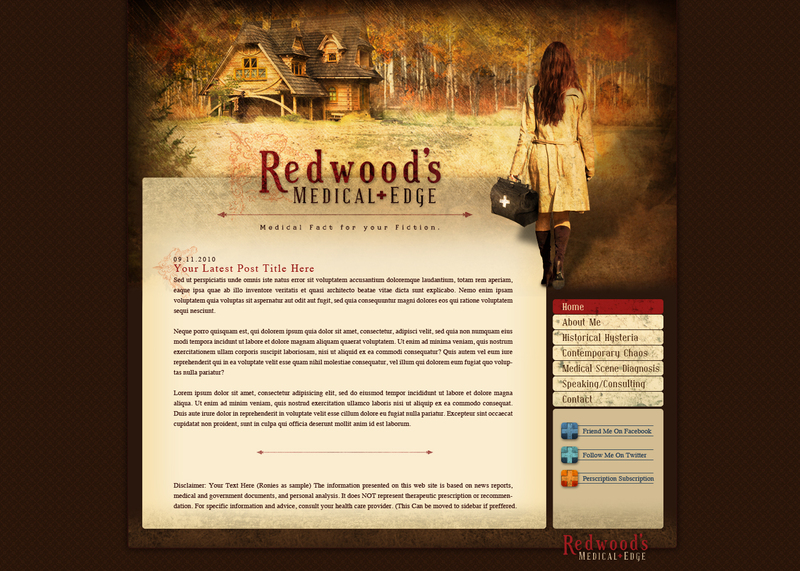 This entry was posted in Fiction, Marketing and Promotion, Publishing, Writing and tagged Brand, Branding, Jordyn Redwood, Redwood's Medical Edge by Jordyn Redwood. Bookmark the permalink. Great site, Jordyn. I like how you were able to work with your designer to get just the look and feel you wanted. Timely post, as I’m revamping my blog even now. I’m still mulling the whole “branding” question over. I find it more challenging to answer now that I’ve crossed over to the “Dark Side,” i.e. I’m writing fiction instead of non-fiction. Welcome to the dark side! That’s awesome. What type of fiction? Did you hear about the webinar ACFW is hosting about author websites? I think it is tomorrow night. Contemporary romance–my novel debuts May 2012. I did hear about the webinar, but will have to catch it another time. Your website is excellent, by the way. Thanks, Beth! Looks like our novels will be coming out at the same time. Keep me posted about your journey. As I work to establish my brand, there is far less time to write! It is a double edged sword for sure. Hopefully, in the end, the time you spend building a strong brand will sell more novels. Hi Jordyn. I am very new to blogging (since this May) so when I started I went to blogger and did my own. I like it and the people that have visited it have been complimentary about it, but I don’t think it’s doing anything to help with branding. I didn’t even know what branding was when I started it! When I write fiction it is inspirational/romance/with a little suspense. Non-fiction is about hospice (where I work) and social work, and Christian living. Hmm… Anyway, this is a great post and I love the look of your blog (and the others). One day I would like to work with a designer to create something really great. I’m establishing a non-profit and will be creating a website for that, so maybe I need to move the non-fiction things to that site, and then rework my current blog for the fiction stuff???? Lots to think about. My advice would be to separate them out. Martha Carr did a great post on her blog about sticking to one genre. I think it might help you: http://www.marthacarr.com/wpmc/?p=556. If your passion is both of these venues, I would develop them separately. Your target audience is going to be very different. One or the other I would do under a pen name. I’m like you. I would like to do some non fiction as well. I think it is important in the beginning to stick with one passion and develop it. Personally, I think dividing your efforts has the potential to weaken both. Thanks Jordyn – I second that – there are consequences for everything and my experience is right on with what Jordyn said – dividing my efforts weakened both. I had sort of the same question, I have already created a new site for one of my passions. I’m currently working with a designer on getting the “brand” look going for that one. This post was timely for me. Thanks for the suggestions on working with them. My other site is just me as a writer and my life, not as focused as the new one. I’ll keep them both going though…and start to think about the “brand” of the old one. You’ll have to let me know what you think, Donna. Now you’ve got me thinking ahead, Jordyn. I don’t have a contract yet, but am writing contemporary women’s fiction. My blog has a decidedly Victorian look-and-feel. I designed it myself and I love it, but it would do nothing to promote my brand, when the time comes. I love how you tweaked your design until it felt exactly right for your brand. You’ve succeeded! Thanks, Katy. Spend time now doing your research. I was just contracted this year. My official web site hasn’t been launched yet. I’m going to do it about three months before the release of the novel. However, right now, I have the design done and will be working on the content over the next several months. I’m not sure having a web site is beneficial until you have a contract. My blog has served me well to help people get to know me. Maybe consider going forward with just a tweak of your blog design for more of a contemporary women’s feel. Always an interesting topic of discussion. Great reminders and food for thought. Thanks! Great post! Jordyn, what do you recommend for authors that cross genres? For instance, children’s picture books, and women’s Christian non-fiction. Maybe a little something of both I suppose? Read through my comment to Sherri above where I address this issue and check out Martha’s post by following the link. It’s good food for thought. Let me know if that’s helpful for you. Very good stuff, Jordyn! I LOVE your website. I’ve heard such good things about Tekeme. Oohhh, looks like I made a good change then. Thanks for stopping by, Erica! As for my brand…I am currently reading “We are Not Alone: The Writer’s Guide to Social Media,” by Kristen Lamb. I am learning a lot (mostly that I have gone about this whole branding thing all wrong…but luckily nothing that can’t be fixed!). I’ve heard more than one writer talk about Kristen Lamb’s work. I think it’s about time for me to start reading her stuff! I still have a ton to learn myself. This is such great advice! I used to kinda just do whatever on my blog– and change the background on a whim– and it made it feel very disjointed. No one knew what to expect. I love your blog… and the idea is so creative and “branded”. Thanks for the great post. Thanks, Erin. Looking forward to guest blogging for you!! Jordyn – What a great post. You said a lot about focus in such a short space, which is the point! I am still struggling some with branding on my web site and this helps. I think I get confused when I try to combine readers getting to know me with getting to know my work. Thanks for those examples too – loved them, so helpful! Jordyn, thanks for this. What great examples you gave us. My brand is “help for hurting people.” There’s a giant couch on my blog, and a list of 100 self care items people can download. And all my posts offer some sort of emotional help to people. I took a look at your blog. What about putting two people on the couch? One comforting the other? Also, I would make your “help for hurting people” where you have your “rumor of glory”– I think this sends a more clear message. It feels very peaceful. I think that’s a nice feeling to have if you’re trying to put a calming influence into a person’s turbulent time of life. These are merely suggestions. It does look professional. What do others think? Any other tips for Lucille? I really enjoyed your post. I also went to your blog and found it very informative. I will enjoy reading it. Thank you for your help. I write suspense and don’t want to make serious errors. I do have a little medical knowledge but I worked in a hospital thirty years ago so I know a few things have changed. Thanks again for your help. Thanks for your comment, Glenda. I’m glad you’re finding my medical blog for writers useful. Let me know if you have any medical questions for your ms! Jordyn (and blog readers) – I could use some of the same type of advice or ideas you offered Lucille. I’m looking to create a more focused brand on my blog with the intended readership – women who read thrillers. The themes ideally would involve overcoming thru faith, politics, family and dead bodies/suspense. All ideas from the new thriller. I’m a little stumped. Any ideas how I could take all of that and come up with a brand? Hey, Martha, I think your brand will evolve as you concentrate on those things you mentioned. If your thrillers include things like faith, politics, family and dead bodies, those are all things that can allow some variety to your posts. The challenge will be to keep the focus on the suspense thread. Whatever visuals you choose will be the first clue to the reader, followed by consistent content. If it’s what you love to write about, that should work. Just give it some time, be consistent in posting and true to the feel of what you want your books to evoke in others. 🙂 All the best to you! I agree with, Maureen. My challenge was, I didn’t want to become “pegged” as just a medical suspense author. I wanted a little more room to create plot lines that, though may involve medical scenes, weren’t the crux of the novel. I’m going with a straight suspense feel. Unless all your novels will all be political thrillers— which maybe they will be– I’d stick to the broadest category to attract the most readers. Don’t discount those men even though they are in the minority. What a wonderful example to see the difference in the two designs! All of your hesitations were so logical, and the changes appropriate. It’s a warm and inviting site – thanks for sharing the experience. Thanks for all your comments, Maureen. There’s a lot of wisdom in what you told Martha. Thank you! I am a blog designer, and this post is EXACTLY what I would like clients to know! So often, people write in a certain “niche” and want their blog to look exactly like everyone else’s blog in their niche. Unfortunately, this means that everyone ends up with a similar design, and after you look at a hundred of them, no one sticks out any more! 😦 I tell my clients to ask themselves, will anyone remember your blog after they look at hundreds more in the same niche? I just finished a design for a writer (joynmalik.com) and she went with a writing theme. However, we incorporated aspects of her indian heritage to give the design a distinct look that (hopefully!) is memorable as well. Thanks for your comment, Melanie. Sounds like you’re giving your clients solid advice. I think it’s good to get a feel for what other writers in your genre are doing and the “feel” of it but, the greatest challenge (and you’re exactly right)– will they remember it. I looked at that site for your author. Very nice! Definitely speaks of writing and the colors lend to her heritage. I am a freelance editor, finding my brand as I type this comment. 2 days ago put up a blog, fb person, fb page, twitter account and by the end of today I will have a website up. All will be linking under my name. So far, I am a little shakey on how to really stomp in my brand. I see what authors do on their websites, but how about branding for freelance editors? Thoughts? Tips? Insight? Thanks for posting today. If anything – you have put another burning ember under me. Thanks for your comment, Tiffany. Where I would personally start is to look at every freelance editor’s web presence I could think of and take a look at what they’re doing. This will start the idea process in your mind. What do you like? What do you hate? How can your site be different? How can it clearly convey your work? One thing I actually ask our clients NOT to do is go around and look at everyone else, because it takes away from the originality of the clients design. I always want our clients to look inside of themselves, to spend some time away from the computer actually…. away from other influences… and just think… what makes me ME? what will make my site, my site? ask your friends and family… what is it like when you’re in my presence? warm and comfy? bright and fun? relaxed and cool? Step away, figure out who you are, what your business is, what kind of books you want to edit, and which you want to stay away from…. For us, when we work with clients on branding… we start out with a logo. And we talk over the phone… figuring these things out with you. The logo is the first step. From there, the website builds off of that. And that’s the point that we ask clients to start looking at other sites… just to get a clear idea of what to do for the design. Marcy and Lisa– thanks for stopping by. I think you could get a professional blog design for $300-500 dollars. It is a lot of money but not in comparision to a full web design. Also, the designer I worked with can function within WordPress or Blogger. My blog design is on blogger. So the site your on shouldn’t limit your design potential with a professional. If it does, keep looking. Also— think more broad than just this one book. Will the two of you be collaborating on more novels in the future? What is that genre? Your blog should work at building a reader base for more than just one piece of work. Read Seth Godin’s book– Tribes. You’ll hear a lot of talk from those seeking publication about building your tribe. It will be important for your book proposal, how you will market to those people who are most likely to buy it. Your blog should reach out to those people. 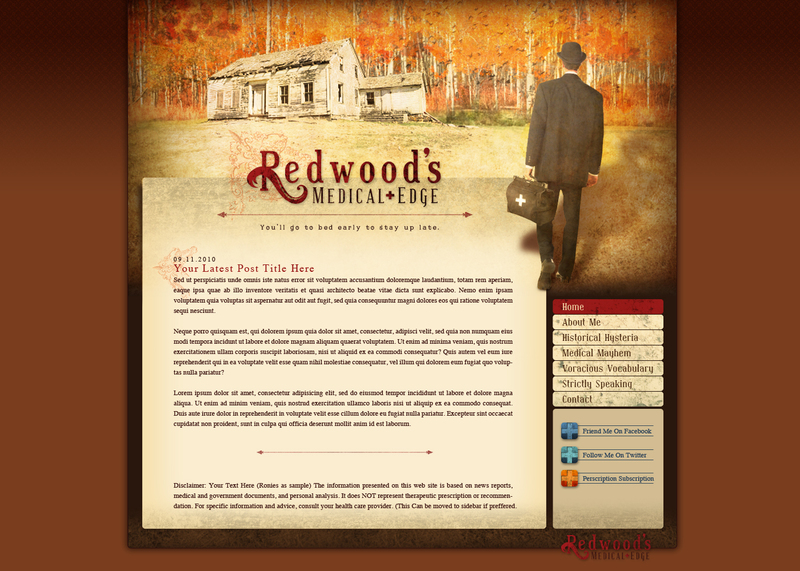 For instance, my blog has a medical theme and feel. My novels will hint at this as well. Is there a theme you could concentrate on? We can’t ever know about those conversations that these writers had with their editors. I will say though that these authors you mention do have a strong brand. I’ve never read John Steinbeck but he is a western author. He has a strong brand. All of these writers stuck to one genre. This likely helped them build their brand even if no such word was said in their meetings with their editor/publishing house. Unfortunately, these are the times we live in. If you’re seeking traditional publication, publishing houses are going to want to know if you’re thinking about these lines. What are you doing to build your brand, your tribe? How are you going to market to these people? Now, you can go the e-route and likely publish whatever your heart desires. That’s the wonderful thing about the time we live in. You have every right to buck the notion of this system and give it a go outside all of these “rules”. I wrote it today! Isn’t that funny timing? We were thinking about the same thing! Took a look at your post, Ashley. It’s definitely a good starting point for those that are venturing into their branding journey. Very good tips to start the thinking process. Ok, lots of good stuff here. Will check out Tekeme myself! I love that you put the two versions of your webpage in the article. Of course, your points were spot on and the second is very effective. Not sure I want to brand myself as two hundred years old since I’m writing about 1778. Have to do some thinking about how to apply your excellent thoughts to my own WIP site.